Give your staff access to the features they need to perform their management tasks within your software. 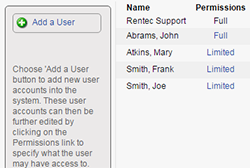 Multi-user accounts allow multiple people to access the same account with their own unique username and password. The primary account holder can also set detailed permissions or limitations for each user to only access information relevant to their work tasks or management portfolio. How to manage multiple user accounts.